This story is sponsored by Chas Swedberg. I am grateful for his generous support of The Orbit through our Kickstarter campaign. 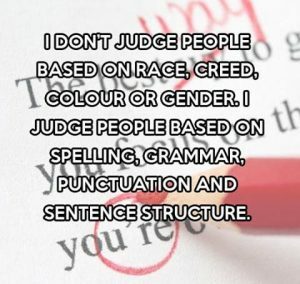 Without correct language to describe me a lot of other labels were put onto me instead. I struggled enormously socially, and since I was awkward and weird the blame for the bullying I received was put on me. As I entered middle school I was seriously socially delayed and tried everything I could think of to make or keep friends. Assuming people didn’t like me because I wasn’t interesting enough, I lied dramatically in an attempt to seem interesting. Unsurprisingly, the stories I created didn’t actually work to attract friends, but they did manage to harm my family, and eventually caused my social situation in school to become so bad that my parents switched my school to another. These lies were a big deal, and broke down trust between myself and my parents completely. I was already struggling with emotional development, academic achievement, and pretty much every other facet of my life. The destruction of any trust in my family lead to many years of fighting, struggle, and broken relationships. In my own mind, and in the ways in which my parents and every institution around me responded, I was a Bad Kid. Being a Bad Kid is incredibly hard to recover from. Everyone around you sees you through that lens. Once a kid is seen as “troubled” or “delinquent” or anything similar it is almost impossible to get back to being normal, or having anyone see you as a success. This view of me, by myself and others, eventually lead to me being institutionalized, and then eventually kicked out of that institution as I approached my 18th birthday. Only in my early 30’s did what happened during those years become clear to me. As soon as the word “autism” was applied to me I began to see the whole experience in a new light. I was not a bad kid. I was an autistic kid in a system that could not recognize me as such, and did not support me in any of the ways I needed to be supported. In place of accommodations and understanding I was given blame. My relationship with my parents is quite good now. In part this is because we worked hard to repair things between us in my 20’s, but a large part of it is also that we now have the language to talk about how things were when I was a kid. Finding the language to describe my difficulties was nearly as healing for my mother as it was for me. As I learned that my failures were not my fault, she also learned that they were mostly not hers either. I try to remember this when dealing with other people. I know now that bad information at a critical stage can lead to a cascade of impacts that seriously harm someone’s life. It’s not always easy to avoid assuming the worst about someone who does something harmful, like telling elaborate lies that hurt those around them, but I try. Noise is really hard for me to deal with. Of all sensory input, hearing is definitely the one I struggle with the most day to day, far more than any other. I am easily irritated with noise, and in extreme situations it can overwhelm to the point of incoherence. It’s easy for others who do not live in my head to guess that volume is the main problem here. After all, I often use earplugs to moderate noise and allow me to be in environments I would otherwise not function well in. Yes, volume is part of the problem, but it’s not the more significant one. What really bothers me is what I perceive as chaos. I’ve done a few reviews of events now, and I intend to do more in the future. Some have focused specifically on accessibility issues, while others have included them along with other discussions of the events. On both of the event reviews I have done on The Orbit I noted that the events DID have a harassment policy on those sites, which were easy to find. This is likely because social justice communities have demanded harassment policies for years and many well known people will not speak at events that do not have those polices highly visible on their websites. This weekend my spouse and I had the pleasure to attend A Celebration of Star Trek at DePaul University in Chicago. This was a one day free conference, open to the public, and hosted in the downtown (Loop) campus of DePaul, right in the center of Chicago. Specifically, this conference was hosted by the Media and Cinema Studies program at DePaul. DePaul University is the largest Catholic University in the United States. The event itself included a full day of speakers and panels, as well as lots of showings of episodes from the various Trek shows. There were also several vendors, a silent auction that benefited ChimpHaven, and a book sale at the Barnes and Noble store within the same building. I attended one Klingon history lecture, two panels, and two show screenings. I would have stayed longer, but I wasn’t feeling well and had to head home early. Sometimes I notice that a lot of my classmates sit in class, body still, hands still, looking to the front of the room, in what appears to be full attention. Setting aside the texters and chatters (less common in my classes now that I’m an upperclassman), there seem to be a lot of attentive, if quiet, students. They may or may not participate in class conversation, but their whole quiet bodies exude polite attention. To me this looks like a superpower. If I want to actually absorb anything said in class I cannot do that. I can sit still, but it takes so much of my attention to do so that my mind wanders and I miss important parts of a class discussion or lecture. Actually looking at the instructor the whole time is difficult in a way that’s hard to explain, even though I don’t normally have trouble looking at people in social situations. I need to do something else with my hands and my eyes in order to follow the lecture. My stimming doesn’t look much like stereotypical autistic habits, though I have been known to hand-flap when very excited. Instead, I have drawn the same patterns down the edges of my notepapers in class since middle school. I buy nice pens in many colors in order to do this in the most satisfying way, with bright colored uni-ball Vision pens having the best feel and color saturation. My notes ALL look like this, from 6th grade Social Studies through college Ecology courses. I take notes too, of course, but the rest of the time I am carefully drawing my patterns over and over. 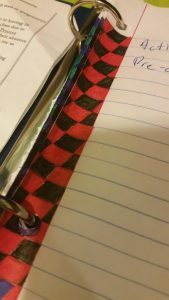 Image is of a diagonal checkerboard pattern in red and black along the edge of a loose leaf sheet of paper in a 3 ring binder. These days I also use fidget toys in situations where doodling my lines isn’t feasible, such as sitting in talks without desks or tables. My favorite fidgets are hard plastic movable toys. They need to be very quiet and have as smooth of a texture as possible. I particularly love the Jeliku Toy and Tangle Jr. These aren’t as good as doodling though, which just seems to open up my ears and calm my mind like nothing else. I definitely learn best when I can doodle my lines. There’s good reason to let autistic learners stim in ways that allow us to learn better. If we’re spending energy trying to repress our habitual stimming behavior, that is energy not going to learning. I am lucky that I have had very little trouble in college with professors questioning my doodling, but it definitely got negative attention from teachers in middle and high school, who saw it as a sign I wasn’t paying attention. In fact, I’m often the first student to respond to questions in class, and I participate enthusiastically in class discussions, so I don’t think my professors worry that I don’t know what’s going on – they realize pretty quickly that even though I’m not looking at them, I’m hearing everything they say. CN: Very mild mentions of ableism, trans erasure, alcohol. I attended Freethought Festival in Madison Wisconsin this past weekend. This was the 5th time the students at University of Wisconsin have hosted this event, and I have attended all of them largely because it’s free and in my home town. Three Orbit bloggers, Heina, Greta, and Alix, have spoken at this event over the years. Freethought Festival (FTF) is definitely a mainstream Atheist event. The keynote speaker this year was James Randi, though I missed his talk because I needed to leave town. Despite being a student-run event, the audience isn’t very diverse, with a high percentage of older white men. The speakers were 69% male, 85% white this year, though this has varied in years past with a more gender balanced group of speakers in 2015 and 2013. It does not put itself forward as a social justice event, but has featured talks with distinctly justice oriented themes, such as Alix’s talk on diversity in the atheist community in 2012 and Desiree Schell’s talk on the links between unions and freethought in 2013. In the 5 years I have attended FTF I have not attended every talk or every social event, but I have attended some portion of all 5 events. I have seen some really fascinating talks, and a few boring ones. I have heard some things I disagreed with from the stage, but that is to be expected, and nothing really stands out to me as shockingly offensive in my memory. The event is FREE! This is a major bonus for those, like me, who have little funds to attend atheist conventions. If you can get there, you can attend. The event itself is free, and located in an area with reasonably inexpensive food, including grocery stores and fast food nearby (there are great restaurants too). Those who live in Madison can get there easily, but those from outside the area may struggle to find highly affordable accommodations in the downtown area. There is a hostel in the area though, which may be the cheapest option for visitors. It’s a short bus or medium length walk from campus. The spaces used by this event have been increasingly attractive and comfortable over the past few years. It began in a lecture hall in the old uncomfortable Humanities Building, and has moved to more and more comfortable spaces over time. The most recent space was a big ballroom in a brand new building, with neat textured wood walls and a generally clean and well-made feel. It definitely feels different than the old lecture hall and the audio-visual tech has improved dramatically over the years. FTF has a harassment policy on their website, which is easily found on the “Event Information” page. The policy is a pretty standard boilerplate policy, without any glaring problems. In my experience the wording of a harassment policy isn’t as important as how it is enforced, and I am not aware of any problems with enforcement at this particular event. In fact, since I am not involved in the running of this event, I’m unaware of any reported incidents of harassment so it is possible that there have not been any reasons for enforcement at this time. I did NOT see any paperwork on the harassment policy at the event itself, including on the registration desk, but I didn’t go looking for it either. One way this event could improve is by making the policy (or a short version of it) visible at the event itself. The website and physical location had absolutely no recognition that I could find of the existence of disabled attendees. While the building it was held in this year and the past few years have complied with ADA requirements (unlike the first year), there was no seating set aside for people using mobility devices, no ASL interpretation or transcription, no discussion of accessibility issues on the website or paperwork at registration. This is a major area that FTF could improve. It is incredibly inexpensive to include accessibility information on the website and to set aside reserved mobility seating at the event. While including interpreters and similar accommodations can be expensive, I think it’s worth it to make an event accessible to more attendees. From a neuroaccessibility perspective I didn’t find this event to be as comfortable as I found Skepticon this past year. That event actively works to recognize that their attendees have varied physical needs and have been at the forefront of accessible events even while still charging nothing to attend. At FTF I brought my own fidgets and found that the volume was very comfortable for me (maybe too quiet for others) but it didn’t feel like a space that was actively trying to be inclusive of everyone. The building FTF was held in this year, as well as the one with the social events, did not have a gender neutral bathroom, or at least not one that was easy to find. If there is one available, this should be indicated to attendees with signs or something similar. The absence of neutral bathrooms, and no commentary about it, indicates that the event organizers may be unaware that this is an important issue. Gender non-binary attendees and trans attendees who desire neutral bathrooms should have a safe place to use, and if none is available the event should work to remedy this situation and acknowledge the problem publicly. The social events for FTF are a major area in which they could improve. People are encouraged to socialize at the Union South, a student union several blocks walk from the main event. The Union itself is pretty cool, but the rooms these events have been in for the past 2 years are frankly boring and uncomfortable. This year there was definitely not enough space for the number of people who wanted to socialize due to the building code restrictions, which meant people spilled out into the halls. The social culture revolves around beer and talking very loudly in rooms that echo. Not great. Even worse, you have to go down a flight of stairs and across the lower level into a SUPER loud bar area to order beer or appetizers, then bring them back up to the socializing area. I’m sure alternatives must exist for this set-up, perhaps in any one of the many near-campus restaurants or coffee shops nearby. In fact, an alcohol-free social event in a nearby coffee shop would be ideal. I like drinking, but this is a student run event that should include the underage students they want to reach, and the social events should reflect that. I’m going to keep attending Freethought Festival in future years, because they continue to bring in speakers I am interested in seeing and it’s easy for me to go to a free event in my home town. I’d love to see the improvements in accessibility and social events that could lead to this being a much more accepting and fun event to attend. Businesses these days are highly dependent on good reviews. A positive score on Yelp, Amazon, or Trip Advisor can make or break a small business. For service industry businesses like restaurants, retail, and hospitality this can create some unique conflicts. Specifically, not everything people include in their reviews is easy for the business to control, and customers interactions with other customers can have an unexpectedly large impact on review scores. When customers hold a business accountable for the behavior of other customers, this can have good impacts. It can help encourage a bar to kick out men who are overly creepy to women, or give a reason for a hotel to ask a very loud party group to be quiet or leave. When customer reviews help keep businesses from participating in oppression, or help them to keep rude people in check, this is great! However, the expectations of customers can also carry bigotry of their own. Customers can, and do, let their own prejudices influence their view of a business, and can bring down the rating of businesses because the perceive them as having too many people of color, or too many queer people, or too many poor people. This can put pressure on a business to be more oppressive, rather than less. This problem becomes particularly stark when businesses deal with customers who are disabled in various ways, especially those with mental illness or disabilities that make people behave in strange ways. As a result of cultural ableism, many people become incredibly uncomfortable when they encounter someone behaving strangely. If they check into a hotel, and there is someone pacing and talking to themselves, the customer’s whole experience is influenced by the discomfort they have with the possibly mentally ill person. When an autistic child makes noise in a theater, the rest of the audience has reactions to that, and most of those reactions are bad. Different, disabled, and ill people should have access to businesses and experiences just like everyone else. That child has a right to attend the theater and the person talking to themselves has a right to stay in a hotel. If the general public becomes less ableist and more understanding of all disabilities, but especially those that are related to the kinds of behaviors that make neurotypical people uncomfortable, this will mean businesses will not suffer when they serve disabled customers. Businesses have a responsibility to serve all customers equally, and those that do so will be more successful when their customers recognize that. I encourage service industry businesses to strive to serve disabled customers well, and also to work with disabled communities to decrease ableism in the general culture. It will help those businesses in the long run when all of their customers understand that we all have rights, even when our behavior may seem strange.